Image Rights: Reproduced with permission of The British Library. All images on this website are reproduced with permission of the Libraries, Archives, and Owners of the manuscripts. Manuscript images that appear on this website remain in the copyright of the libraries where the manuscripts are held. Use of these images for any purpose other than private study without written permission of those libraries is prohibited by law. lower case 'a' is almost invariably of this squarish formation. this scribe has several upper case 'A's but this one with squared off upper lobe is frequently used. 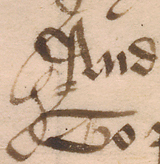 variations on this form of 'A' are found frequently in documents copied by Hoccleve. a more elaborate version of the previous 'A'. The scribe appears to experiment with many of his 'A' graphs. the typical formation of the looped 'd' graph. 'd' in final position with tag used rarely on these folios. 'd' in the display script used for rubrics in the scribe's hand. upper case letter at the beginning of a line. a very angular form of 'g' which is used as standard in this manuscript. 'g' with addendum perhaps for extra 'e'. 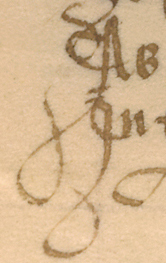 when 'g' is on the bottom line, the scribe frequently extends and curls the tail. Here the word is within the body of the verse but the address to Prince Henry at the beginning of the 'Regimine' perhaps encouraged a more elaborate treatment. 'h' is rarely crossed on the sampled folios. Here the graph is crossed when in the 'ch' combination. note the treatment of the tail-stroke. This is a feature which the scribe uses on several graphs, perhaps to provide a decorative effect. although not always present on upper case 'H' it is just possible to see the loop to the left of the stem beneath the red and blue used for the paraphs and the tail-stroke of 'h' from the line above which cuts through the top of the graph. 'r' in initial position. The image shows the size of 'r', sitting just above the line and at the same level as the following graph. The scribe's 'r's frequently sit on the line. 'z'-shaped 'r' almost always appears with otiose stroke. Used frequently not only after 'o'. an example of the lengthened 'r' graph, here with flourish perhaps to replace final 'e'. an elaborate upper case graph at the beginning of a line. kidney-shaped 's' used consistently in final position. long 's' used in initial and medial positions. The stem of 's' is not extended very much below the lower level of the body of the text. final 's' in the scribe's display script used for rubrics. on these folios 'w' varies little in formation, although some graphs seem more spikey than others. the superscript letter is just above the graph. upper case graph with more open head-strokes and spiked left arm. 'y' is almost always dotted. the tail of 'y' has numerous variations as may be seen in the examples shown here. 'y' with straight stroke as a tail. thorn is not used consistently. It is used for initial 'th' in definite articles, pronouns, abbreviation for 'that' etc. However, there is no definite pattern and the use of thorn may be associated with length of line. thorn is also used in final position for 'th', in words such as 'with' as here or for verb endings. The stem of thorn slants backwards slightly. yogh again is not used consistently but is in the scribe's repertoire when he wishes to use it. Here it is used as representative of the 'gh' sound. yogh used initially as representative of the 'y' sound. a variation on 'W' at the beginning of a stanza with wide upward sweep of the arms of the graph. yet another variation on 'A' with distinctive foot at the base of the right arm, also found in many documentary hands. upper case 'P' again at the beginning of a stanza. A lozenge-shaped dot in the centre of the graph. The hooked stroke to the left of the graph is frequently added to other upper case letters at the beginning of lines. a serrated letter at the beginning of the Explicit. on some folios only the scribe allows himself the licence to add various otiose strokes to the final strokes of 'h', 'm' and 'n'. these extra otiose extensions do not appear on every folio. 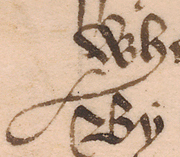 the scribe also extends the descenders of some graphs out into the left margin. an example of upper case 'I' with deep fork at the head. Compared with the example in version 2 this image shows how a scribe may have a variety of graphs for a single letter. upper case 'I' with squared-off head-stroke. These two different 'I' graphs demonstrate that a scribe may have a choice in the graphs he selects. an upper case 'A' which is distinctive but different from the other examples of upper case 'A' by this scribe. Note the circular addition to the left side of the graph. a similar upper case 'A'. Both examples shown here have a pair of parallel lines crossing the left arm of the graph.